This is not a post that’s going to guide you and your questioning as to why or why not to go BYOD (Bring Your Own Device) and is not going to provide you definitive answers as to the pros and cons. It is reflections of the BYOD process by some who have been through the implementation and truly what the answers were that it provided. It is a collaboration of how educators led their schools to be #futureready in this time of flux and the need for leadership to benefit student engagement and learning. For public schools, there is a movement to embrace the Future Ready Pledge….as an independent school educator personally, I think it is crucial for the larger education community, public and private, to come together to do what is best for our students through the modalities that best engage them. In this post, it is a refection on what the three of us have to share about our experiences in going BYOD to limit the financial burden, but realize the greater educational implications that coincide in part with the @All4Ed momentum. A financial, inventory solution, that was so much more…. Eagle Hill-Southport is an independent school for students with language based learning disabilities. As well as a classroom teacher, I have served as Academic Technology Coordinator and now Director of Technology. Technology as a tool when I started there was for word processing. Slowly but surely teachers and students learned the power of using technology to support skill acquisition as well as provide a path for students to demonstrate their knowledge through multi-modal methods that highlighted their strengths. The challenge suddenly became that we did not have enough devices in the building to support regularly cross-curricular usage for the entire student population. How to fund more device purchasing is a concern for public and private schools alike….my suggestion was go BYOD. Despite trepidations and concerns from admins, January 2012, mid-school year, a BYOD initiative was launched. By January 2013, 75% of students were utilizing their own devices, and currently it is even higher. While it did solve the lack of inventory without putting a financial burden on the school, it led to greater solutions. BYOD opened the door for students with learning differences to learn how to access content in differentiated ways, and gave them tools to organize, produce, and to grow. For the students @EHSSouthport, BYOD gave them a path to own their learning within our walls, and empowered them to advocate for utilizing technology to support their weaknesses and show their strengths in settings beyond. 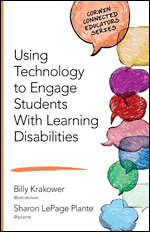 BYOD was a solution, that became an accommodation, that became a strong illustration of how while technology is just a tool, it can be a powerful tool for those with learning disabilities. Moving 88 miles per hour, both in and out of school…. As of last year, the East Penn School District – a suburban school district located about an hour north of Philadelphia – had experienced such progressive initiatives as project-based learning, STEM (science, technology, engineering, and mathematics), and makerspaces. The seven elementary schools contained a decent amount of technology: a few white clamshell MacBook carts per building, some primary level rooms with a handful of PCs towards the back, the occasional Windows laptop cart that was well past its prime, and some iPads here and there. However, despite all of these tools, there was a glaring need for the progressive district to do a better job of getting technology in front of its students on a more frequent basis. With so many of these students possessing their own mobile devices, BYOD was the obvious answer in order to assist students in moving 88 miles per hour, both in and out of school! The BYOD initiative started at the elementary level, mostly because this is where (1) students are less likely to cause problems with their personal devices (2) there is more of an emphasis on effective pedagogy, and (3) teachers are more willing to partake. Throughout the majority of the 2013-2014 school year, two elementary school educators – a fifth grade teacher and a fourth grade teacher (me) – led BYOD classrooms in what was called a pre-pilot. The idea was for these participants to “work out the kinks” in order to help the initiative run that much smoother in the following years. As of now, I can only speak to the effectiveness of the pre-pilot in my own classroom. As a teacher who had been teaching the same grade level for the sixth straight year, the program served as the catalyst for several exciting instructional shifts that I was able to make. Reflecting upon what took place, some of the lessons I learned include: students should always have their devices readily available as there is no such thing as “BYOD time,” students should constantly leverage the same devices and programs between school and home, learning should be redefined as students use their devices to accomplish tasks that would not otherwise be possible without the technology itself, digital citizenship must be stressed in both a proactive and reactive fashion, and classroom parents should be made aware of all of the above and a whole lot more. Sayreville is a suburban and a “blue collar” school district in New Jersey. Over the years, many school budgets have failed to pass and therefore the first thing that was usually cut was the technology budget. Over the past nine years at Sayreville I have been in charge of both the infrastructure as well as the instructional sides of technology. I initiated the “Sayreville Technology Academy” where teacher turn-key teaching other teachers on integrating technology in the classroom. But with all the purchase there never seemed to be enough technology time and devices for students and teachers to really integrate the use of technology in the classroom. The option was to go 1-1 but the community could never afford to purchase a device per student for the school district. At an Edscape conference, Lisa Neilsen, in her session, talked about students using their personal cell phones in the classroom. This sparked the idea that maybe if students use their own device in the classroom, then it would be like have 1-1 but students would be using their own device, BYOD. I immediately began doing research, attended conferences, visited schools, spoke to other technology directors both in New Jersey and in other states about their implementation of BYOD. After two years of research, I presented my idea to the district technology planning committee. I distributed my research, sent emails and invited committee members and board members to attend conferences and session on BYOD. With buy-in from the school board and the community, we began the BYOD journey in 2012. Initially, I requested the technology policy to be re-written to include personal devices as well as responsibilities of staff and students using their personal devices on the district WiFi. Then requested the funding to upgrade the district infrastructure for implementing BYOD and completed the project. The BYOD in Sayreville is primarily in the Middle and the High Schools. The teachers and staff are also given BYOD access. Many of the behavioral issues that teachers believed would be a problem with BYOD has not occurred. Teachers have stated that students are more focused on their lessons, students participate more in the class, the lessons sometimes take on a “life of their own”, and the teachers have been able to change from a teacher-centered lesson to a student-centered lesson. One thing that has happened that participating teachers believe BYOD has been effective in the instructional and learning process two years ago in the AP US History Class, that implemented the BYOD model of technology in the classroom. After the students took at AP exam and the results came back, it was the highest AP scores the district had ever seen. I have done several survey of the students and they love having access to the district WiFi on their personal device because it is what they are comfortable using. They also stated that they can do research at anytime, create a document for notes, create videos for projects, use the calendar for homework and after school club scheduling, etc. The HS has an app and now students can get announcements, schedules, grades, emails, student handbook, student code of conduct, etc. Also the district is GAFE, and students and teachers can collaborate using Google Docs, Google Classroom, Gmail, etc. At the Middle School students can BYOD except for cell phones. It was the only way I could approval from the Middle School administrative staff but the teachers that are doing BYOD love it. They create centers or groups of students in the class and the students share their projects, information, etc. with their other classmates. The equity issue for students is constantly on my mind but to assist, there are devices in the classrooms that students can use during class time. BYOD is not mandated for every teacher in the Middle or High Schools. A teacher can choose to participate or not. Even though there are a few that prefer not having students use their personal device in class, the amount of teacher that particpate in BYOD continues to grow. For Sayreville it has been a positive situation so far and as more and more industries adopt the use of BYOD in their offices and business units, this practice for students of Sayreville will be one they will already know how to navigate. I personally thank Ross and Sandra for collaborating on this post, as they are persons very passionate about making a difference in education. It is truly through the connection and greater discussion of what is needed in education, in the public and private sector, that will impact learning and our students. The collective momentum of educators in online and face to face spaces, with the support of the @OfficeofEdTech across the 50 states, that will what truly going to make a difference for the individualized experiences of our learners, no matter what modality we chose to engage them with. I have never heard of BYOD before reading this. I think it is a great concept to get into the school system. Not something that is mandatory but an option to have. It would be good for group work or rotations seeing as how not every student may be able to bring something. Thanks for sharing! It’s amazing to hear that the idea of BYOD is still something new to people. It is definitely work consideration and discussion by school districts as a cost effective way to increase the usage of technology appropriately in education settings. Thanks for reading! Reblogged this on Ross Cooper.